The world’s first plug-in hybrid SUV drives like no other car on the planet. Twin electric motors and a highly efficient petrol engine optimise performance according to how you want to drive. It’s freedom. Smooth, quiet, cocooning comfort with abundant power to tackle off-road terrain with highly efficient purpose. Go beyond the boundaries of ordinary driving. There’s more to enjoy and discover. 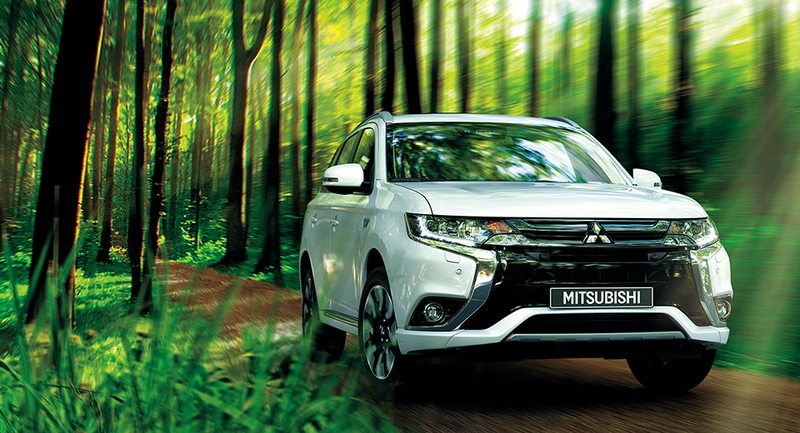 Experience the many advantages of Mitsubishi Motors’ innovative Plug-in Hybrid EV system with Twin Motor 4WD and S-AWC. You’ll enjoy not only the solid stability of an advanced 4WD system, but also the dynamic driving performance and incredibly quiet ride that only separately mounted motors at the front and rear axles can bring. The OUTLANDER PHEV responds faithfully to every command to keep you in total control. Innovative Twin Motor 4WD teams with S-AWC to supply optimal torque and traction to each wheel, now with more responsive acceleration during EV driving. So you enjoy smooth, powerful acceleration and sure, stable handling in all road conditions. The innovative Plug-in Hybrid EV system is remarkably eco efficient. Enjoy zero fuel consumption and zero CO2 emissions during all-electric driving — as well as an incredibly quiet ride. Or enter a hybrid mode to travel even greater distances with low emissions and an impressive 1.7 litre/100 km combined fuel efficiency. You can even generate electricity as you drive to enjoy vast stretches of wilderness with total confidence. Advanced safety technology supports safer, more confident driving — on the road and in parking lots, day and night. From intelligent sensors that track your surroundings and warn you of danger to active driving assistance and solid passive protection, the OUTLANDER PHEV delivers all around high levels of safety.